The macula is the small portion of the retina located at the center of this light sensitive lining at the back of the eye. The macula is responsible for sharp, straight-ahead vision necessary for functions such as reading, driving a car, and recognizing faces. The effect of this disease can range from mild vision loss to central blindness. That is, blindness “straight-ahead” but with normal peripheral vision from the non-macular part of the retina which is undamaged by the disease. 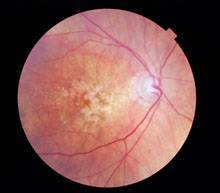 Ninety percent of AMD is of the atrophic or dry variety. 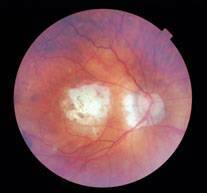 It is characterized by a thinning of the macular tissue, develops slowly, and usually only causes mild visual loss. The main symptom is often only a dimming of vision when reading. The second form of AMD is called exudative or wet because of the abnormal growth of new blood vessels under the macula where they leak and eventually create a large blind spot in the central vision. This form of the disease is a much greater threat to vision than the more common dry type. Macular degeneration is most common in people over the age of 60, but there have been some cases affecting people as young as their 40’s and 50’s. Symptoms include blurry or fuzzy vision, straight lines like telephone poles and sides of buildings appearing wavy, and a dark or empty area appearing in the center of vision. Unfortunately, the cause of this eye condition is not fully understood, but it is associated with the aging process. As we age, we become more susceptible to numerous degenerative processes like arthritis, heart conditions, cancer, cataracts and macular degeneration. These conditions may be caused by the body’s overproduction of free radicals. These extra electrons are quite destructive and cause cellular damage, alter DNA, and are thought to be at least partially responsible for many of the degenerative diseases mentioned above. The production of these free radicals is normal during metabolism but the body produces its own “anti-oxidants” to neutralize them. Some of the vitamins in the food we eat also have anti-oxidant properties. These are vitamins A, C, E and beta carotene. Unfortunately, smoking, poor nutrition and other lifestyle factors result in the over production of too many free radicals. For this reason, lifestyle factors may contribute to the risk of AMD. There is some evidence to suggest that AMD has a genetic basis, as the condition does tend to run in families. Exposure to certain types of light may also play a role. Studies done on fishermen in the Chesapeake Bay suggest that long term exposure to ultraviolet light from the sun may increase the risk of AMD and other eye conditions, such as the development of cataracts. In the dry type of the disease, some form of inflammation may also be a factor, though what causes the inflammation is unknown. Although researchers are spending a great deal of time investigating the cause and treatment of AMD, there is no real cure available. The goal of current treatment efforts is to stabilize the condition. For the more severe wet form of the disease, doctors may try laser photocoagulation. This treatment, however, is not without dangers and is only beneficial in the very early stages of the condition. That is why early detection is so important. This technique involves directing a beam of laser light at the abnormal blood vessels in order to destroy them and prevent their leaking. Provided that the blood vessels have not grown under the macula, this treatment can be helpful in arresting the progress of the disease. If the blood vessels are already under the macula, the laser may cause scarring and permanent vision loss. A new type of treatment called photodynamic therapy is presently under investigation and shows considerable promise. A drug called BPD is put into the affected eye and in only a few minutes the eye is exposed to a non thermal red light. This light activates the drug to close and seal off the abnormal blood vessels. The entire treatment only takes about 30 minutes and requires no anesthetic. Preliminary results have been quite promising. No treatment exists for the dry form, but many doctors are convinced that a combination of specific vitamins and minerals helps slow the progression of the disease. This has yet to be confirmed scientifically but there are valid reasons for attempting this therapy. Anti-oxidant vitamins such as Eye Promise may help to neutralize the free radicals that are associated with this degenerative process. Zinc, one of the most common trace minerals in our body, is highly concentrated in the retina and surrounding tissues and is a requirement for chemical reactions in the retina. Fat soluble anti-oxidant vitamins like vitamin A and vitamin E are stored in the body and can increase to toxic levels if over used and zinc may interfere with other trace minerals like copper. Caution should therefore be exercised in the use of vitamins and minerals. 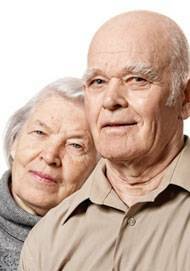 Next time you’re in the office ask our Doctors about Eye Promise supplements to prevent macular degeneration. All patients who are at high risk of developing or patients who have the beginning signs of the disease should be on a specific vitamin dosage to help prevent the degenerative process.